Caprese is one of my favorite words in the whole wide world, because it means tomatoes and mozzarella and basil. Sometimes it is a salad. Sometimes it is a pizza. 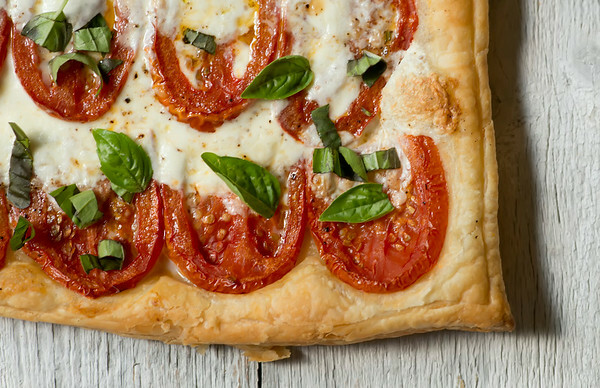 Sometimes it is both, which is the best of both worlds and which I like to call Caprese Pastry, because it calls for that magical thing that is frozen puff pastry. 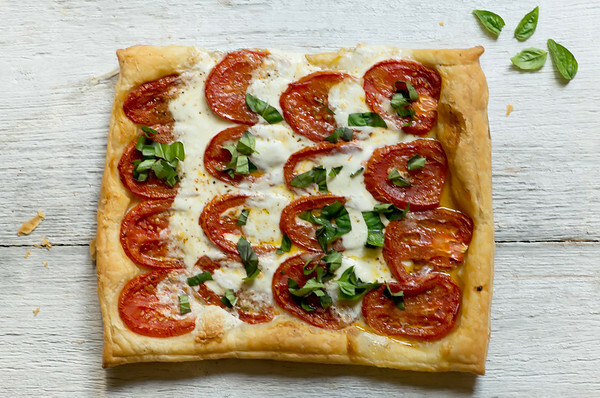 So when the tomatoes are local and the basil is fresh and when you can find yourself a hunk of the best mozzarella you can, break out the puff pastry and get ready for the deliciousness that is Caprese Pastry. Puff pastry is usually found in the freezer section somewhere near the desserts. You’ll want to let it defrost for about 30-45 minutes while you are getting the tomatoes and the cheese ready. I like to let mine defrost right on a silicone baking sheet or a piece of parchment, because we are going to flatten it out just a little more before we caprese it. Slice the tomatoes as thinly as you can and roast them up – the thicker the are, the heavier your caprese will be. Which is not necessarily a bad thing, but I like my caprese pastry on the thinner side. So I can have more slices. I’m not ashamed to say it. Same goes for the mozzarella cheese – nice and thin – and while I am on the subject I need to give a shout-out to the best mozzarella cheese in the state of New Jersey, which is from Vito’s in Secaucus. Melt. In. Your. Mouth. Once you have everything all nice and sliced and your pastry is defrosted, give the pastry a roll or two with the rolling pin to flatten it out just a tad. It’s going to look plenty thin already, but trust me when I say this stuff is called puff pastry for a reason. Puffing is going to happen. Now layer the tomatoes and cheese in neat rows, just overlapping one row with the other. You want about four rows of each. Slide the whole thing onto a rimmed baking sheet (rimmed to protect your oven from any cheese drippage) and bake it up for about 15 minutes, until the cheese is melty and the pastry is puffy. When it comes out, let it cool for a minute or two and then scatter a generous handful of basil on top. Drizzle with a little olive oil, grind on some cracked pepper, and then cut it into slices with your handy pizza cutter. Caprese pastry is melty and drippy in the best way possible, so I like to eat mine with a knife and fork. The Southern husband totally and exclusively picks it up with his hands and digs in. Either way is completely acceptable and totally delicious. So there you have it – caprese pastry! I think thinks absolutely counts as dessert, don’t you? Pre-heat oven to 425. Lay the tomatoes in a single layer on a foil-lined rimmed baking sheet and drizzle with olive oil. Sprinkle with salt and roast until soft, about 30 minutes. Cool slightly and turn oven down to 400. Place defrosted pastry on a piece of parchment or a silicone baking sheet. Roll a few times with a rolling pin and transfer the whole thing to a rimmed baking sheet. Place the tomatoes and cheese in four slightly overlapping rows. Drizzle with olive oil, grind some pepper on top and bake until pastry is puffed and golden, about 15 minutes. Cool slightly, scatter basil leaves on top, drizzle with a little more oil, grind on some pepper, cut into squares and serve. Hi – do you think you could also make this on the grill instead of the oven? Hmm. I don’t know if the puff pastry could stand up to the heat of the grill. Maybe if you did it on a pizza stone on the grill, and kept a close eye on the heat? Let me know if you try it! Thank you for this yummy recipe. I use asparagus and gruyere cheese to make a tart and it is a favorite of ours so I know we will love the caprese version. Ok, you had me at Caprese! 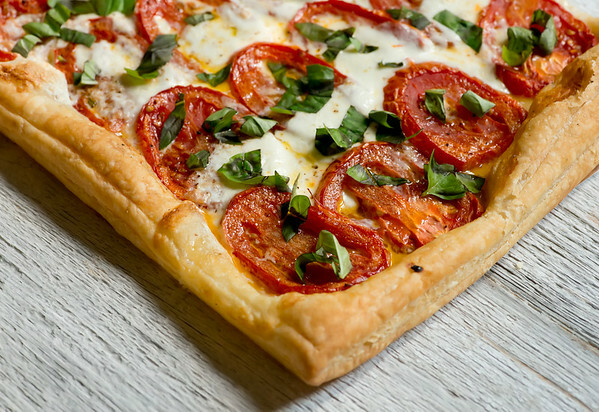 I love anything Caprese and your Caprese Pastry is calling my name. Perhaps with a little drizzle of a balsamic reduction? I do really think that caprese is the best word in the English language. And in the Italian language.